From intricate tapestries to architectural marvels, Peru is home to one of South America’s most sophisticated ancient civilizations with over 5000 years of history to its name. The Incas left a legacy of agricultural ingenuity, spiritual wisdom, masterful artwork and elaborate cuisine that can still be appreciated to this day. Beyond the renown archeological site of Machu Picchu, the country has even more to offer. Several sites tucked in the Sacred Valley await to be explored, from farmlands thriving with multi-colored potatoes and corn to the mystic villages of the highlands. Cusco, with its colonial charm and yet distinct Incan spirit, is one of South America’s most well preserved towns. Arequipa, the “white city” sits high on the Andean plateau guarded by three volcanoes and plays an important role in Peru’s gastronomical renaissance. Peru’s historical and cultural sophistication reveals itself in all facets of its rich heritage, inviting travelers to delve into its mystical world. The Incan reverence to Earth and complete equilibrium with the environment is complemented by an abundance of diverse natural wonders. The country has three distinct regions: the coastal desert, where Lima and other major cities are located; the Andean Highlands, home to some of the most intriguing indigenous communities and archeological remnants of the ancient world; and the virgin rainforest, rich in a biodiversity that is native to the Amazon. Peru’s dramatic landscapes and sensational historical sites leave every traveler in awe. Peru's coastal capital is a relaxed but lively city with a vibrant culinary and arts scene that goes beyond the historical relics of its colonial past found in the old city centre. A charming outpost at the crossroads of indigenous, colonial and Incan history that serves as the perfect departure point to explore the Sacred Valley and Machu Picchu. The heart of both the Incan Empire and today's Qechua communities, the Sacred Valley is dotted with ancient citadels and engineering marvels as well as indigenous weaving villages and colourful markets. As the departure point for the lost city of Machu Picchu and many other adventure-filled activities, the Sacred Valley is thriving with life. The highest navigable lake in the world, Titicaca is believed to be the birthplace of the Sun in the Incan tradition. At the southern foothills of the Andes lies the Sechura Desert, home to the pre-Columbine geoglyphs of Nazca and the Huacachina Oasis. At the foothill of Misti Volcano lies the White City of Arequipa - a colonial gem that can easily be paired with the Colca Canyon to witness the flight of the famous condor. Peru's wild coast is dotted with sleepy fishing villages and bohemian beachside towns perfect for unwinding, detoxing and surfing. 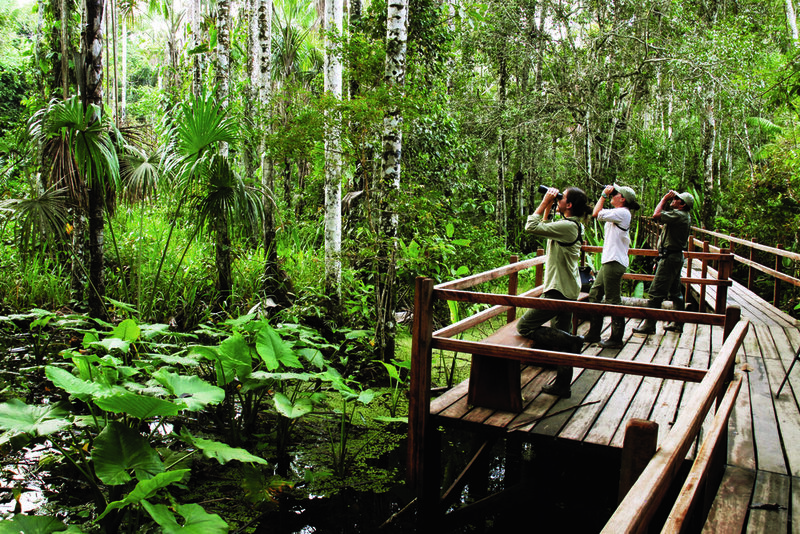 Covering about 60 percent of the country, the Peruvian Amazon can be explored from the northern region of Iquitos or the southern region of Madre de Dios. Both areas are home to a large diversity of flora, fauna and indigenous settlements. From Iquitos, cruise the rainforest from the river on an intimate cruise, or stay in a missionary-style hacienda on the banks of the river in Madre de Dios.